Hello Ladies, I am back today to share a mini mixed media (collage) canvas using a very awesome bird Digi image from A day for daisies for my debut project at Jo's scrap shack Blog challenges. You can join the Blog challenge at every week with a interesting yet easy peasy themes to play with. 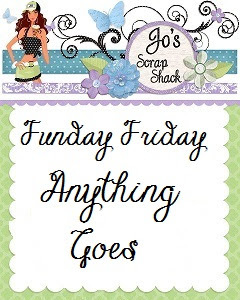 This week we have "Anything goes" theme so get creative and join us at Jo's scrap Shack. I loved how it turned out and just took 8 minutes to complete the project..i will share tutorial here below,make your hands messy and go crazy in crafting I say.. Here are the pics for you now...do not forget to let me know how it is,i love to hear from you. click here to shop for the image. Chevron stencils dabbed yellow acrylic paint. Folk art Festive Paints pack. Beautiful mini canvas, great image. Just BEAUTIFUL! A great design! Thank you for joining Try It On Tuesday! I love this cute, beautiful mini mixed media collage. Super design. A gorgeous canvas Roshini. The background looks fabulous and I love the colours of the bird. Great mixed media project! The beautiful bird jumps out from the background. Thanks for joining us for this week's Color Throwdown! Beautiful mini canvas and you did that in 8 mins??? wow...that's great.hanks for sharing this with us at Rhedd's Creative Spirit this month. Good Luck, Rupa. Awesome canvas. I absolutely luv the bird and the deep green on te background. Thank you for playing along with us at SSS Monday Challenge. Macarena. This is beautiful! I love the bird and design. The colors are awesome too! Thanks for joining us on the Simon Says Stamp Monday Challenge. WOW! You made this in EIGHT MINUTES? That not only makes you super-talented, but super-fast, too! I just adore how this turned out and the details are beautiful. I really like how you have the subtle text pattern on your bird and it stands out from the background, yet still fits in perfectly with the artistic vibe you established. I also thought the sentiment was perfect and goes along so well with the image. You did a really lovely job on this and I'm so glad you shared your talents with us here at the Simon Says Stamp Monday Challenge Blog! Welcome to the team, Roshini! This canvas is fabulous! Mixed Media rather scares me, but obviously you don't have any trouble with it! Love the text on the bird, it really makes the images look extra special. Gorgeous canvas Roshini! The little bird is adorable and the colours & layers are wonderful. gorgeous colours used and just adore your birdie. Thank you for sharing with us over at Rhedd's Creative Spirit this month and hope to see you again in future challenges. WoW! This is gorgeous! I love this cute little bird! Thanks for joining us this month at MHKDesigns Monthly Challenge! This is beautiful, the layers and shimmer with this sweet bird are fabulous. Thanks for joining us at MHKDesigns. 8 minutes!? Wow! It usually takes me longer than that just to decide on the colour I want to use! lol. Das ist so entzückend, ich bin total begeistert ! A fab entry for our challenge this month over at Altered Eclectics...I especially love the background.. This is SO CUTE! I love it and think its a great entry for the challenge this month! Love the text on the bird.